Businesses today need technology solutions that help improve communications, while driving productivity across the enterprise. You also want a reliable, high quality phone system that simply works. And with your business in a constant state of change, you need a solution that’s both easy to learn, and easy to use. Today, transforming your phone system is simple and cost effective, regardless of your business—whether you have two employees or fifty. Southpointe Telecom's platform adapts and adjusts to your needs, seamlessly working the way you need it to. That way, you can focus on your business, not your communication system. We are both a supplier of phone systems as well as an FCC Registered phone carrier for IP based and PBX conventional systems. Call us today for a free quote to see how our VOIP phone service can replace your existing phone bill and save you money while giving your the quick connections needed to talk with your most important client. Of all the decisions you are faced with, one of the most important is the office phone system. This is the ‘front door’ of your business. How the phones are handled when a customer calls can set the tone for an ongoing client relationship or it can come to an abrupt end. Surprisingly, this is the most ‘overlooked’ area of a business. Most owners and managers are listening from the inside and don’t really hear what the customer hears when calling for the first time. Here are some of the decisions you will need to make for an efficient working system that gives the caller a ‘comfortable feeling’ that he/she is being treated with the most importance in your company. as low $36.99/month per line. 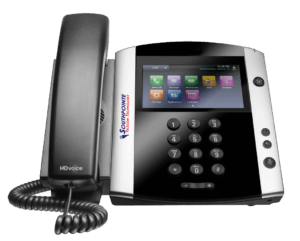 Southpointe VoIP phones allow for seamless connectivity between multiple offices, home, and cell phones. Do I use Auto attendant or answer every call live? Another overlooked area is the dead silence callers hear while waiting for a call to be transferred. Music on hold assures the caller that he was not hung up on (and his cell phone did not disconnect). Another option is special ‘Message on Hold’. This can be music with a customized company message, introduction for special sales, office hours, and new products can be conveyed while the caller is waiting. Script these messages to be informative and interesting. What is Hosted PBX versus VoIP? Hosted PBX (Private Branch Exchange) is the modern version of the traditional telephone with a switching system in the closet. The new hosted, or “cloud,” model puts the brains of your phone closet into professionally maintained data centers, helping businesses like yours to transform their communications and improve productivity—without the need to purchase expensive, complex, depreciating phone system software and hardware. Your service providers manage and monitor your system 24x7, allowing you to focus on work. VOIP refers to phone services that are accessible through a high quality broadband connection. VOIP is typically more cost effective and scalable than traditional alternatives. With both Hosted PBX and VoIP, you and your team can work from the office, home, or on the road, or through your smartphone, all while utilizing your company’s communications solution to help maintain and uplift your image and brand.